Abstract: Heavy metals are natural compounded elements occurring in the environment and different in concentrations along the earth crust. Source of these elements in water and soils mainly include natural occurrence derived from parent materials and anthropogenic activities. Pollution by heavy metals is still a serious problem due to their toxicity and ability to accumulate in the biota, and causes various health problems in humans and animals. This paper discussed the effects and sources of heavy metals as well as phytoremediation techniques. Phytoremediation techniques or strategies seem to be a prosperous way to remediate heavy metals-contaminated environment (water, soil air and others. It has some advantage compared with other used or available physical and chemical process or conventional strategies. There are several factors that must be considered in order achieved a high performance of remediation result, and the most crucial factors is a suitable plant species which can be used to uptake the contaminant. Although, phytoremediation techniques seems to be the most efficient, but it has some limitations. Heavy metals contamination of global environment arises from natural sources directly or indirectly from anthropogenic activities such as rapid industrialization, urbanization, energy generation, improper waste management and other local and/or regional anthropogenic sources . A large quantity of heavy metals associated will anthropogenic activities have seen released into the atmosphere from where they can reach the soil environment and aquatic ecosystem through both dry and wet deposition processes. Apart from soil environment and aquatic ecosystem, atmospheric inorganic contaminants of natural origin or anthropogenic sources that contained heavy metals and or trace elements such as cadmium(cd), chromium(Cr), cobalt (Co), Copper (Cu), Nickel (Ni), Lead (Pb) and Zinc (Zn) at high concentrations could led to serious ecological consequences and pose human health risks . A heavy metals are potentially hazardous to humans and various ecological receptors because of their toxicity, persistence, bioaccumulative and non-biodegradable nature. Therefore monitoring and evaluation of heavy metal concentration in soils, groundwater and atmospheric environment is imperative in order to identify hazards to human health to prevent bioaccumulation in the food chain and further degradation of the ecosystem  . According to  Monitoring and assessment of heavy metals concentrations in the environment contribute towards effective understanding of biogeochemical processes and gauging ecosystem health. 1. Deposition of atmospheric particulates. 2. Disposal of metal enriched sewage sludge and sewages effluents. 3. Emissions from automobiles, metal mining, petroleum production and fossil fuel combustion . Table 1. Anthropogenic Sources of Heavy Metals in the Environment. Paints and pigments plastic stabilizers, electroplating incineration of cadmium containing plastics, phosphate fertilizers. Release from Au-Ag mining and coal combustion, medical waste. Industrial effluents, kitchen appliances, surgical instruments, steel alloys, automobile batteries. Aerial emission from combustion of leaded petrol, battery manufacture, herbicides and insecticides. Combustion of fossil fuels is the principal antheropogenic sources of Be, Co, Hg, Mo, Ni, Sb, Se, Sn, and V, as well as a large contributor of As, Cr, Cu, Mn, and Zn, while industrial metallurgical processes produce the largest emission of As, Cd, Cu, Ni, and Zn (Pacyna 1998 cited in ). However, other sources and mechanisms such as re-suspension of local soil dust through rainfall precipitation and reaching from higher plants might significantly contributes to atmospheric deposition of heavy metals. Table 2. Harmful Effects of Some Heavy Metals. As (as arsenate) is an analoque of phosphate and they interferes with essential cellular processes such as oxidative phosphorylation and ATP synthesis. Carcinogenic, mutagenic, teratogenic; endoerine disruptor; interperes with calcium regulation in biological systems; causes renal failure and chronic anemic (degraechromium (cr): causes hair lose. Elevated levels have 4 seen found to cause brain and kidney damage; liver cirrosisi and chronic anaemia, stomach and intestinal irritation. Anxiety,autoimmnune diseases, depression, difficulty with salance, drowsiness, fatigue, hair lose, insomnia, irritability, memory loss, recurrent infections, restlessness, vision disturbances, tremors, temper outbursts, ulcers and damage to brain, kidney and lungs. Allergic dermatitis known as nickel ltch; inhalation can cause cancer of the lungs, nose and sinuses; cancers of the throat and stomach have also been attributed to its inhalation; hematologic, immunotigic, neurotoxic, genotoxic, reproductive toxic, pulmonary toxic, neparotoxic and hepatotoxic; causes hair loss. Its poisoning causes problems in children such as impaired development, reduce intelligence, loss of short term memory, learning disabilities and coordination problems; causes renal failure; increased risk for development of cardiovascular discourse. Over dose can cause dizziness and fatigue. they can replace essential metals in pigmens or enzymes disrupting their function  . Regarding their toxicities, the most problematic heavy metals are As, Cd, Cr, Cu, Hg, Pb, Sn, and Zn (Wright, 2007; Ghosh, 2010 cited in ). Out of these, As, Cd, Hg, and Pb are non-essential heavy metals while Cu and Zn are essential heavy metals (trace elements). Toxic heavy metals can cause different health problems depending on the heavy metal concerned its concentration and oxidation state, e.t.c. The table below gives harmful effects of selected heavy metals on human health. 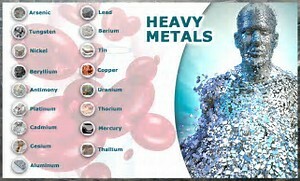 Some of these heavy metals i.e. As, Cd, Hg, Pb or se are not essential for plants growth, since they do not perform any known physiological function in plants, but these Cu, Fe, Mn, Mo, Ni and Zn are essential elements required for normal growth and metabolism of plants, but these elements can easily lead to poisoning when their concentration greater than optimal allures . Uptake of heavy metals by plants and subsequent accumulation along the food chain is a potential threat to animal and human health. The absorption by plants roots is one of the main routs of entrance of heavy metals in the food chain. Absorption and aceunvlation of heavy metals in plant tissue depend upon many factors which include temperature, moisture, organic matter, PH and nutrients availability . Heavy metals accumulation in plants depends upon plant species and the efficiency of different plants in adsorbing metals is evaluated by either plant uptake or soil to plant transfer factors of the metals  . Elevated Pb in soils may decrease soil productivity, and a very low Pb concentration may inhibit some vital plant processes, such as photosynthesis, mitosis and water absorption with toxic symptoms of dark green leaves, within of older leaves, stunted foliage and brown short roots . Heavy metals are potentially toxic and pytotoxicity for plant resulting in chlorosis, weak plant growth, yield depression and may even be accompanied sby reduced nutrient uptake, disorders in plant metabolism and reduced ability to fixate molecular nitrogen in leguminous plants . Kawashigashi, 2009 Saier and Trevors, 2010; Kalre et al, 2011; Sarma, 2011; Singh and Prasad, 2011; Vittanage, et al, 2012) cited in . Phytoremediation consists of the Greek word “phyto” which refers to plant, and the latin suffix remedium” which means curing or restoring. Them main reason for the use of this technique was to collect the contaminants from the media and turn them into easily extractable form (plant tissues). (e) Slectrokinetics (f) Chemical reduction/oxidation. (h) Excavation, retrieval, and off dit disposal. These ecdinologies are cost prohibitive and process often generate secondary waste. Compared to existing physical and chemical methods of soil remediation, the use of plants is cost-effective and this disrupetive for the environment (Cunningham et al. 1995; Terry et. al. 1999; Tsao et al, 2003; Valdes, 2002; Vangronsveld and Cunningham, 1998; Alcantara et al., 2000; cited in . Phytoextaction is the main and most useful phytoremediation technique for removal of heavy metals and metalloids, from polluted oils, sediments or water. The efficiency of phytoextracton depends on many factors like bioavailability of the heavy metals in soil, soil properties, speciation of the heavy metals and plant species concerned. Plants suitable for phytoextraction should have the following characteristics , , , . (a) Easy cultivation and harvest (b) Resistance to pattogens and pests. (e) Repulsion to herbivores to avoid food chair contamination. (f) More accumulation of the target heavy metals from soil. (g) Translocation of the accumulated heavy metals from roots to shoot. (h) Tolerance to the toxic effects of the target heavy metals. (i) Widely distributed and highly branched root system. (j) Good adaptation to prevailing environmental and climatic conditions. 1. The use of hyperaccumulators, which produce comparatively less above ground biomass but accumulate target heavy metals to a greater extent. 2. The application of other plants, such as Brassica juncea (Indian mustard), which accumulate target heavy metals to a lesser extent but produce more above ground biomass so that overall accumulation is comparable to that of hyperaccumulators due to production of more biomass . Grasses are more preferable for phytoextraction than shrubs or trees because of their high growth rate more adaptability to stress environment and high biomass , . Some researchers have evaluated the use of crops (such as maize, and barley) for phytoextroaction of heavy metals. In this case, several cropping are required to lower heavy metal contamination to acceptable levels. However, the use of crops for phytextraction of heavy metals suffers from the disadvantage of contamination of food chain. Rhizofiltration is used to remediate extracted groundwater, surface water and wastewater with low contaminant concentration it is the adsorption or precipitation onto plant roots or absorption of contaminants surrounding the root zone. Rhizofiltration is typically exploited in groundwater (either in situ or extracted), surface water, or waste water for removal of metals or other inorganic compounds. Rhizofiltration can be used for Pb, Cd, Cu, Ni, Zn, and Cr, which are primarily retained within the roots. Rhizofiltration is similar to phytoextraction, but the plants are used contaminated ground water rather than soil. To acclimatize the plants, once a large root system has been developed, contaminated water is collected from a water site and brought to the plants where it is substituted for their water source. The plant are then planted in the contaminated area where the root take up the water and the contaminants along with it. As the roots become saturated with contaminants, they are harvested. Sunflower, Indian mustard, tobacco, rye, spinach and corn have been proved for their ability to remove lead from water, with sunflower having the greatest ability. The advantages associated with this technique are the ability to use both terrestrial and aquatic plants for either in situ or ex situ applications. Also the contaminants do not have to be translocated to the shoots. Thus, species other than hyperaccumulators may be used. Terrestrial plants are preferred because they have a fibrous and much longer root system increasing the amount of root area. Disadvantages include the constant need to adjust pH, plants may first need to be grown in a greenhouse or nursery; there is periodic harvesting and plant disposal; and a good understanding of the xcal speciation/interactions is needed . Phytostabilization aims to retain contaminants in that soil and prevent further dispersal . In this technique, contaminated soil is covered by vegetation tolerant to high concentration one of toxic elements, limiting the soil erosion and leaching of contaminants in to groundwater. Mobility of contaminants can be reduced by surface adsorption/accumulation in roots as well as their precipitation in rhizospheve by induced changes in pH or by oxidation of the root environment . For example, the immobilization of arsenic in iron plates in the rhizophere of salt marsly plants . Phytostabilization can also be promoted by plant species with the capacity to exude high amounts of educating substance. These substance lead to immobilization of contaminants by preventing their absorption, while simultaneously reducing their mobility in soil. Thus, plants with phytostabilization potential can be of great value for the revegetation of mine tailing and contaminated areas . Phytovolatilization is the up take and transpiration of a contaminant by a plant, with release of the contaminant or a modified form of the contaminant to the atmosphere from the plant. Phytovolatilization occurs as growing trees and other plants take up water along with that contaminants. Some of these contaminants can pass through the plants to the leaves and volatilizes into the atmosphere at comparatively low concentrations . Recently, it is discovered that the plants that absorb elemental form of metals from soil, could convert them biologically into gaseous species inside the plant, i.e. biomethylated to form volatile molecules and finally release them to the atmosphere. That mentioned process is controversial of all techniques due to its dubious nature that whether release of these volatilized elements in atmosphere is cape. The disadvantage is the volatilized element could be recycled by precipitation and then redeposit back into ecosystem . According to brooks et al. (1998) the release of volatile se compounds from higher plants was first repaved by Lewis Et al (1999) where as Terry et. al. (1992) reported that members of the brassicceae are capable of releasing up to 40g Se ha-1day-1 as various compounds. B. Metal indicators C. Metal hyperaccumulators. Prevent metal from entering their aerial parts or maintain low and constant metal concentration over a broad range of metal concentration in soil, they mainly restrict metal in their roots. The plant may alter the membrane permeability, change metal binding capacity of cell wall or exude more educating substance . Accumulate heavy metals in their aerial parts. As the name indicates, these plants generally reflect heavy metal concentrations in the substrate , . They tolerate the existing concentration level of metals by producing intracellular metal binding compounds (Chelators), or alter metal compartmentalization pattern by storing metals in non-sensitive parts . Hyperaccumulators are plants, which can concentrate heavy metals in their above ground tissues to levels far exceeding those present in soil or in the nearby growing non-accumulating plants , , . Baker and Brooks have defined metal hyperaccumulator as plants that contain more than or up to 0.1% i.e. more than (1000mg/g) of Cu, Cd, Cr, Pb, Ni, Co ro 1% (> 10,000mg/g) of Zn or Mn in the dry matter for Cd and other rare metals, it is > 0.01% by dry weight (Baker and Brooks, 1989). Researchers how that more than 400 plant species have been identified as metal hyperaccumulators with more than 300 Ni-hyperaccumulators , , , . That use of hyperacccumulators for phytoremediation might result in production of a bio-ore of some commercial value to cope with some of the cost of soil remediation. Table 3. Plants use as Phytoremediators. (a) Phytoremediation may be publicly more acceptable, aesthetically pleasing and less disruptive than physical and chemical process. (b) It is highly effective in contaminant reduction, low-cost, applicable for wide range of contaminants, and is an environmental friendly method. (c) It’s effectiveness in reducing that concentration of heavy metal ions to very low levels and the use of inexpensive biosorbent materials. (d) It is the cheapest and cleanest technology employed in eh remediation of selected hazardous sits. (e) It encompasses a number of different methods that can lead to contaminant degradation. (f) Phytoremediation is an innovative, cost effective alternative to the more established treatment methods used at hazardous waste sites. (g) It offers unique, low cost solutions to many currently problems of soil contamination. (h) It requires non expensive equipment or highly specialized personnel. (i) It is cost effective for large volumes of water having low concentrations of contaminants and for large areas having low to moderately contaminated surface soils. (j) It is functional to a wide range of toxic heavy metals and radionuclide. (k) Phytoremediation is regarded as a new approach for the clean up of contaminated soils, water and air. (l) It is used for the generation of a recyclable metal rich plant residue. (m) It is a viable option for decontamination of heavy metal polluted soils, when the biomass produced during the phytoremediation process is economically valorized in the form of bioenergy. (a) Phytoremediation may be a time-consuming process, and may take at least several growing seasons to clean up a site. (b) The products formed from those organic or inorganic contaminants may be cytotoxic to plants. (c) It is limited by the growth ate of the plants. (d) Phytoextraction or degration need several years to accomplish. (e) Phytoremediation might be suited for rural/remote areas where human contact is limited or where soil contamination does not require an intermediate response. (f) Success of phytoremediation may be limited by factors such as growing time, climate, root depth, soil chemistry and level of contamination , . Heavy metals pollution due to rapid increased in industrialization urbanization, together with uncertainly raise in population growth and agricultural activities has bring the threat of raising different effects in natural environment (soil, water, air and others). Heavy metals causes different impacts (negatively) to humans, animals, soils, plants and well as others. The need for removing or reducing the amount of these contaminants has increased over the last few decades with phytoremediation being the suitable techniques for this tasks. Phytoremediation techniques or strategies, seems to be a prosperous way to remediate heavy metals-contaminated environment (water, soil air and others. It has some advantage compared with other used or available physical and chemical process or conventional strategies. There are several factors that must be considered in order achieved a high performance of remediation result, and the most crucial factors is a suitable plant species which can be used to uptake the contaminant. Although, phytoremediation techniques seems to be the most efficient, but it has some limitations. Aniefiok E. Ite, Uwem U. Ubong, Usoro M. Etesin, Edet W. Nsi, Emmanuel J. Ukpong, Akanino N. Ekanem, Usenobong F. Ufrt, and Anietimfon I. Udo, “Heavy metals in Epiphytic Lichens and Mosses of Producing Communities of Ekel and Ibeno, Akwo Ibom State – Nigeria.” American Journal of Environmental Protection, Vol. 4, No.2 (2016): 38-47. Eisler, R., Eisler’s Encyclopedia of Environmentally Hazardous priority Chemicals, Amsterdam, the Netherlands: Elsevier Science, 2007. Environmental protection, 2(1). 22-31, 2014. Etesin, U. M., A. E. Ite, T. A. Harry, C. E. Bassey, and E. W. Nsi, “Assessment of cadmium and lead distribution in the outcrop Rocks of Abakaliki Anticlinorium in the southern Benue Trough, Nigeria”. Journal of Environmental pollution and Human Health, 3(3). 62-69. 2015.
applications.” Journal of chemosphere, Elsevier Science, (2013) 91:869-881. Mudipalli, A., (2008). “Metals (Micro nutrients or toxicants) and global health.” Indian Journal of Med. Res. 128, 331-334. Malayeri, B. E., Chehregani, A., Yousefi, N., and Lorestani, B., (2008). Identification of the hyper accumulator plants in copper and iron mine in Iran. Pakistan journal of boil. Sci. 11, 490 – 492. Singh, J., and Kalamdhad, A. S., “Effects of Heavy metals on soil, plants, human health and Aquatic life.” Int. J. Res. Chem. Environ. Vol. 1 (2) 15-21 (2011). Khan. S., Cao, Q., Zheng, Y. M., Huany, Y. Z., and Zhu, Y. G. (2008). Health risks of heavy metals in contaminated soils and food crops irrigated with wastewater in Beijing, China. Environ. Pol. 152, 686-692. Bhattacharryya, P., Chakrabarti, K., Chakraborty, A., Tripathy S. and Powell, M. A. (2008). Fractionation and bioavailability of Pb in Municipal solid waste compost and Pb uptake by rice straw and grain under susmerged condition in amended soil. Geosciences journal, 12, (1), 41-45. Guala, S. D., Vega, F. A., and Corelo, E. F. (2010). The dynamics of heavy metals in plant-soil interactions. Ecological modeling, 221, 1148-1152. Greipsson, S. (2011). Phytoremediation. Nat. Educ. Knowl. 2, 7. M. N. V. Prasad, Phytoremediation of metal-polluted ecosystems: Hype for commercialization, Russian journal of plant physiology, 2003, Vol. 50(5) 686-700. Sakakibara, M., Ohmori, Y., Ha, N. TH., Sano, S., and Sera, K., (2011). Phytoremediation of heavy metal contaminated water and sediment by eleocharis acucularis. Clean: soil, Air, water 39, 735-741. Shabani, M., and Sayadi, M.H. (2012). Evaluation of heavy metals accumulation by two emergent macrophytts from the polluted soil: an environmental study. Environmentalist 39, 91-98. Adesodun, J. K., Arayese, M. O, Agvaje, T., Osadiaye, B. A., Mafe, O., and sovetive, A. A. (2010). Phytoremediation potential of sunflowers (Tittionia diver sifolia and helianttius annuus) for metals in soils contaminated with zinc and lead nitratts. Water Air soil pollut, 207, 195-201. Li. J. T., Liao, b., Lan, C.y., Ye, Z.H., Baker, A. J. M., and Shuw.s. (2010). Cadmium tolerance and accumulation in cultivars of a high biomass tropical tree (Averrhoa carambola) and its potential for phytoextraction. J. Environ. Qual. 39, 1262-1268. Malik, R. N., Husain, S. Z., and Nazir, I. (2010). Heavy metal contamination and accumulation in soil and wild plant species from industrial area of Islamabad, Pakistan. Pak. J. Bot. 42, 291-301. Dominguez M. T, Madrid F, Maranaon T, Murillo J. M. Cadmium availability in soil and retention in oak roots: potential for phytostabilization. Chemosphere 2009. 76, 480-486. Paulo et al., (2014) “Phytoremediation of soils contaminated with metals and metalloids at mining areas: potential of native flora! Intech http://dx.doi.org/10.5772/57469. Bieby Voijant Tangahu et al., 2011. “A review on Heavy metals (As, Pb, & Hg) uptake by plants through phytoremediation”. Int. J. chemical Engr. Dio: 1155/2011/939161. Isma’il, S. (2012). “Phytoremediation: a green technology”. Iranian J. Plant physiology 3(1), 567-576. Bothe, H. (2011). Plants in heavy metals soils. In: sherameti, I., and Varama, A. (Eds. ), Detoxification of heavy metals, soil Biology, Vol.30. springer-verlag, Berlin Heidelverg, PP. 35-57. Sheoran, V., Sheoran A., and poonia, P. (2011). Role of hyperaccumjulators in phytoextraction of metals from contaminated mining sites: a review. Crit. Rev. Environ. Sci. Alford, E. R., Pilon-Smits, E. A. H. and Paschke, M. W. (2010). Metallophytes – a review from the rhizosphere plant soil 337, 33-50. Ghosh, M., and Singh, S. P. (2005). A review on phytiremediation of heavy metals and utilization of its by products. Appl. Ecol. Environ. Res. 3, 1-18. Memon, A. R., Aktoprakligil, D., Ozdemir, A., and vertil, A. (2001). Heavy metal accumulation and detoxification mechanisms in plants. Turk. J. Bot. 25, 111-121. Memon, A. R., and Schroder, P. (2009). Implications of metal accumulation mechanisms to phytoremediation. Environ. Sci. pollut. Res. 16,162-175. Li, Y. M., Chaney, R., Brewer, E., Rosenserg, R., Angle, J. S., Baker, A., Reeves, R., and Neckin, J., (2003). Development of a technology for commercial phytoeextraction of nickel: economic and Technical considerations. Plant soil 249, 107-115. Prasad, M. N. V., Maleo, P., Waloszek, A., Bojka, M. and stzauka, K. (2001). Physiological responses of Lemna trisulca (duckweed) to cadmium and copper bioaccumulation. Plant Sic., 161: 881 – 889. Vasavi, A. Usha, R., and Swamy, P. M. (2010). Phytoremediation – An overview review. Jr. of Industrial pollution control, 26(1) pp. 83 – 88. Moosavi, S. G and Mohamd J. S. (2013). “Phytoremediation: A review”. Adv. Agri. Biol. 1(1), 5 – 11. Odjegba, V. J., and Fasidi, I. O. (2007). Phytoremediation of heavy metals by Eichhornia Crassipes. Environmentalist 27, 349-355. Sarma, H. (2011). Metal hyperaccumulation in Plants: A review Faculty of Chemical and Natural Resources Engineering focusing on Phytoremediation technology. J. Environ. Sci. University, Malaysia Pahang. Technol. 4, 118-138. Bharudin, B. and Shahrel, Muhd (2008). Lead and Cadmium phytoremediation by water Hyacintt at constructed wetlands in removal in synthetic wastewater using constructed wetland. Taiwan. J. Aquat. Plant manage, 42: 60-68.